Kevin Hannaway and Francis McGuigan claim they were subjected to torture by British authorities in Northern Ireland in the 1970s. THE EUROPEAN COURT of Human Rights has rejected a request by Ireland revise its judgement in the case of the ‘hooded men’ – a case involving the alleged torture and ill-treatment of 14 men who were interned in the North in 1971. This morning’s judgement represents a decision in the case of Ireland v UK on whether or not the treatment of 14 men amounted to torture. The revision request was dismissed by six votes to one by a Chamber. In 2014, Amnesty demanded an independent inquiry in the case of the men. The charity has backed the men’s campaign for decades and first reported on their torture during a 1971 mission to the North to investigate internment. The men are being provided with legal representation by The Pat Finucane Centre, solicitor Kevin Winters and Amnesty International Ireland. An original case at the European Court of Human Rights ruled the techniques they were subjected to during internment constituted inhuman and degrading treatment. The Irish government, in 2014, submitted its revision request on the grounds that new evidence had emerged in a television documentary, which showed, in particular, that the effects of the ill-treatment had been long-term and severe. The government had subsequently obtained archive documents and submitted that a psychiatrist, Dr L, who had been heard as an expert for the UK government in the original proceedings, had misled the Commission by saying that the effects of the ill-treatment were short-lived. The Irish government also referred to other documents released from archives which showed that the British government had tried to prevent the court from accessing the full truth about the five techniques. If the court had been aware of such information, it would have made a finding of torture as well, the Irish government stated. The UK government objected to the revision request. Today, the court found that the documents did not demonstrate facts which were unknown at the time. The court and the Commission had both highlighted a lack of assistance from the UK, which had also conceded that authorisation for the techniques had been given “at high level”. The court held that even if it could be shown that Dr L had provided misleading evidence about long-term psychiatric effects on the men, it could not be said that such knowledge might have had a decisive influence to a finding of torture. In a statement today, Amnesty said today’s ruling was “very disappointing”, but said that it was important to note the nuances in the court’s statement. … In the Court’s words today, ‘where doubts remain as to whether or not a new fact actually did have a decisive influence on the original judgment, legal certainty must prevail and the final judgment must stand’. This is a disappointing outcome on a technical legal point, but is not a finding that the ‘five techniques’ fall short of torture by today’s standards. Grainne Teggart of Amnesty’s Northern Ireland campaigns said that this was a disappointing outcome for the men and their families. “We believe the Court has missed a vital opportunity to put right a historic wrong,” she said. Email “Treatment of 'hooded men' wasn't torture, human rights court rules”. 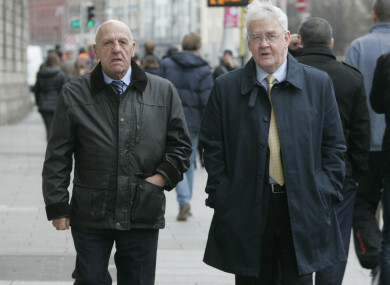 Feedback on “Treatment of 'hooded men' wasn't torture, human rights court rules”.